Knowing what radio to choose can be quite confusing because of the range of models and features available. Here we go through some important considerations when choosing a VHF marine portable of fixed radio? Look at why you need a VHF. If you are a dinghy sailor, jet skier or sea kayaker, space will be an issue and a buoyant waterproof handheld with a long battery life may be desirable for the day long sessions. A large motorboat or yacht sailing further offshore, like above, will need greater range so a fixed mount unit will be a better solution. A larger vessel may opt for dual station control with a remote handset. All yacht and motorboats should consider AIS, either receiver only or a class B transponder. 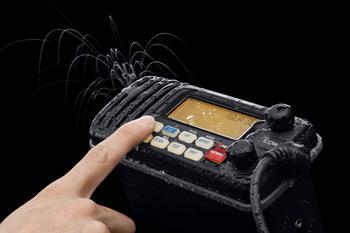 Most handheld VHF’s offer basic functionality. Others offer extras such as DSC. Higher end features are being developed and integrated in modern fixed and handheld units. It is important to bear in mind that in an emergency you want an easy to use radio that is easy to operate and control. 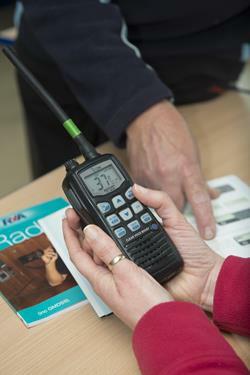 If you are purchasing a Handheld VHF, the radio should come as standard with charger, battery, belt clip and antenna. But if you are a serious user or semi commercial user you may want to see if the radio you are buying has the necessary accessories available to help you. Are there headsets, cases or speaker microphones available? For information about ICOM marine products, visit the marine radio pages on our website.